Yesterday it was the elections day in Romania, the final results are still counted but all the pools show a decisive victory of the communist coalition, just as everyone expected. The country is bracing for at least 4 years of an authoritarian regime, rampant corruption and dissolution of the order of the law. The elections were organized by the same communist regime, the one which, back in the summer, tried a coup d’etat (which partly failed, thanks to the European Union strong intervention) and frauded a referendum, of course they used the same tactics. For example, I travelled in the village of Jupănești in the Argeș county. Here, totally against the law, in the elections day, a huge banner of the communist coalition was placed in front of the voting station entrance. Needless to say, it was the only advertising I saw in the entire village and also needless to say, the village policeman was around, keeping an eye on everything. Actually, after we left the highway (two days before elections, when advertising was still allowed), passing trough villages, I saw only signs for the communist coalition (USL) and an extremist-populist party (PP-DD). 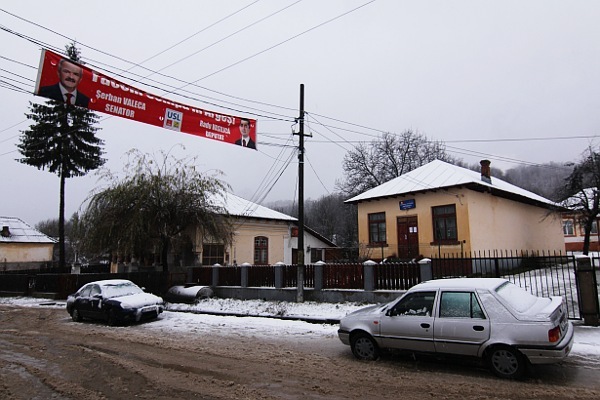 The rural Romania in Argeș was looking like a country where is no democratic party (as far as I know, this is pretty much the case for a large part in the South and the East of the country). This is the current-day Romania: a country with no hope.